Последний раз редактировалось gsmservice.uz; 16.01.2019 в 17:20. Added more than 200 NEW PROVIDER IDs! ORIGINAL UNLOCK by UART PORT (FTDI, PROLIFIC..), WARRANTY PRESERVED !! NO ROOT !! ALL ORIGINAL FACTORY MODE ! Последний раз редактировалось gsmservice.uz; 16.01.2019 в 17:21. Price for 1 IMEI is 1 SPECIAL CREDIT -- Delivery time: INSTANT! Последний раз редактировалось gsmservice.uz; 16.01.2019 в 17:22. 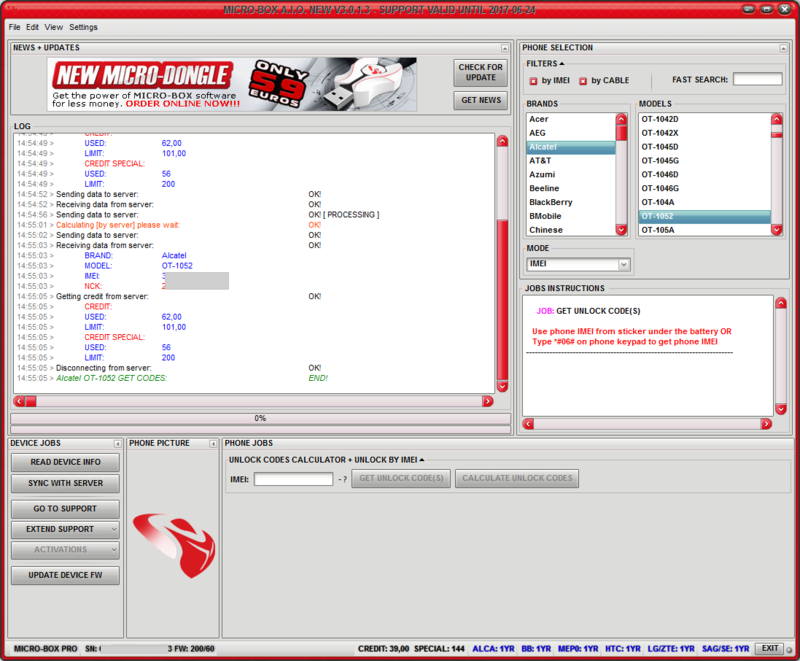 12 Jan 2015 - Micro-Box ALCATEL V1.0.2.2 : ALCATEL FIX + NEW MODELS !! #1 CHECK IT HERE =>#1 [Only Registered and Activated Users Can See Links. Click Here To Register...]! NB : CERT can by found in forum etc .. please don't ask us for that ! LG IS BACK ! By IMEI 2 to 15 minutes delivery ! Price is now 3 Special Credits ! by MODEM and/or UART for ALL SAMSUNG ANDROID MODELS! Generic solution, possible to not work for some models! Последний раз редактировалось gsmservice.uz; 16.01.2019 в 17:23. Added MORE than 500 NEW PROVIDER IDs (PIDs)! Последний раз редактировалось Ganisher; 24.02.2015 в 06:32. - H18 NOA C25 - FIRST IN THE WORLD! 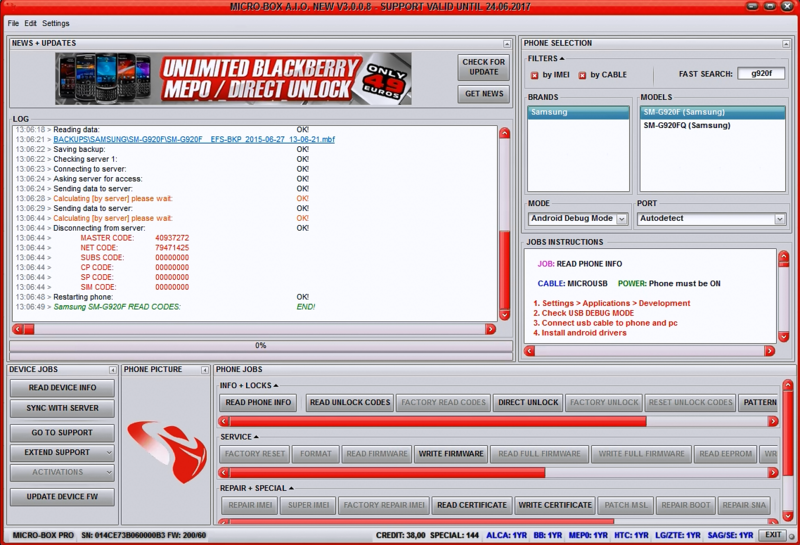 NEW MODELS ADDED for FREE by IMEI: FIRST IN THE WORLD ! Added more than 1500 NEW PROVIDER IDs! 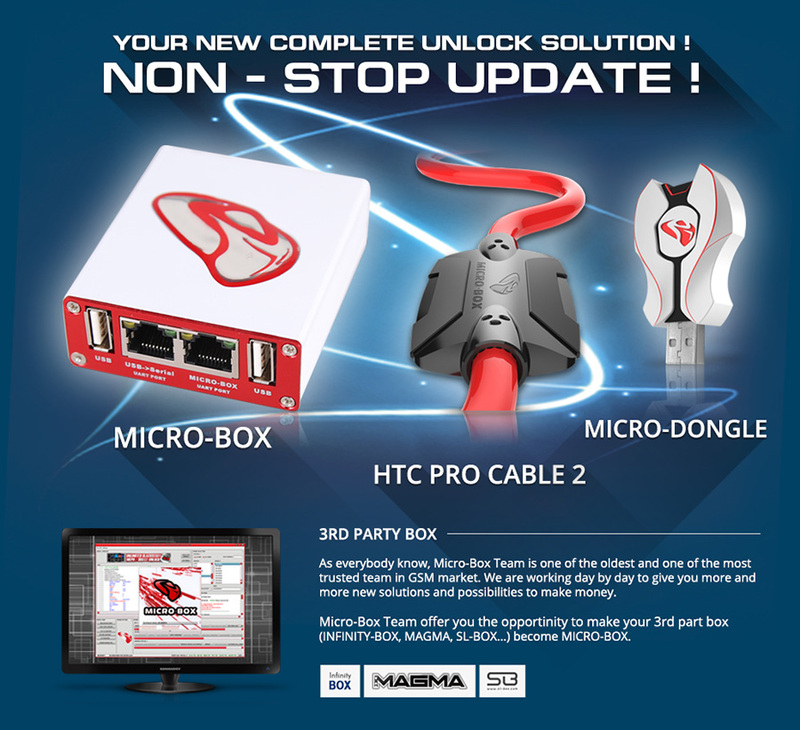 23 June 2015 - Micro-Box A.I.O NEW (All In One) V3.0.0.5 : SUPER HOT SAMSUNG UPDATE! 23 June 2015 - Micro-Box A.I.O NEW (All In One) V3.0.0.5 : SUPER HOT SAMSUNG UPDATE : FIRST IN THE WORLD ! 23 June 2015 - Micro-Box A.I.O NEW (All In One) V3.0.0.5 : SUPER HOT SAMSUNG UPDATE: FIRST IN THE WORLD ! Please select J100H and try read code , please report if success ! 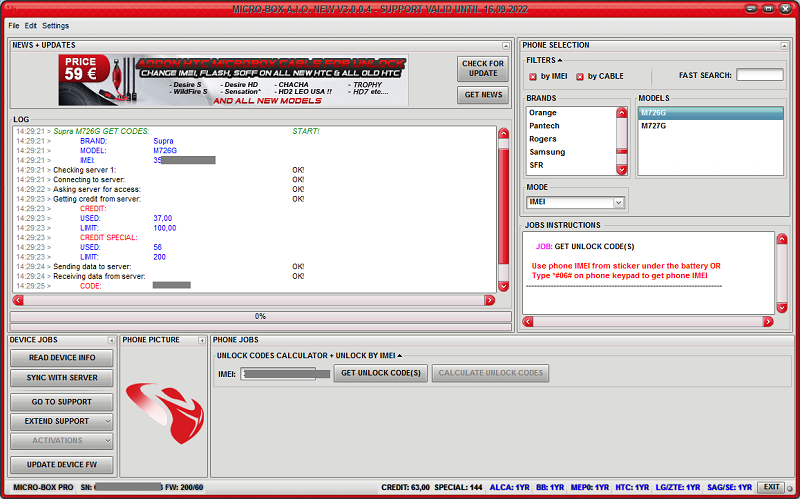 29 06 2015 - Micro-Box A.I.O V3.0.0.8 : FIRST IN THE WORLD - S6 & S6EDGE READCODE !! 29 June 2015 - Micro-Box A.I.O NEW (All In One) V3.0.0.8 : SUPER HOT SAMSUNG UPDATE: READ CODE - S6 FAMILY ! FIRST & UNIQUE IN THE WORLD ! Последний раз редактировалось Jasurchik; 30.06.2015 в 14:25. - Update to AUTOROOT for Samsung Galaxy S6 for support more versions! - Added AUTODETECT DIAG PORT for QUALCOMM MODELS! - Repaired some errors, improved ANDROID DEBUG MODE communication! Please allways use last update ! -Added more than 1000 NEW PROVIDER IDs! Update for Samsung Galaxy S6 AUTOROOT to support more versions! #1 CHECK IT HERE =>#1 SUPPORT WITH VIDEO TUTORIALS !!! #1 CHECK IT HERE =>#1 REALTIME update of SUPPORTED MODELS list ! INCLUDED VIDEO LINKS ! - ZTE Blade L370 => First in the WORLD ! - ZTE Blade Q Lux 3G => First in the WORLD ! - ALCATEL 5016J => First in the WORLD ! NEW MODELS ADDED: FIRST IN THE WORLD! - ALCATEL OT-1052=> First in the WORLD! - ALCATEL OT-2052A=> First in the WORLD! Added more than 1000 NEW PROVIDER IDs! Последний раз редактировалось Jasurchik; 15.10.2015 в 19:08.
with more than 900 NEW PROVIDER IDs!